One Night: Promised is one of those reads, for me, personally, that had such an impact on me that I'm still questioning why I've never heard of Jodi Ellen Malpas before. 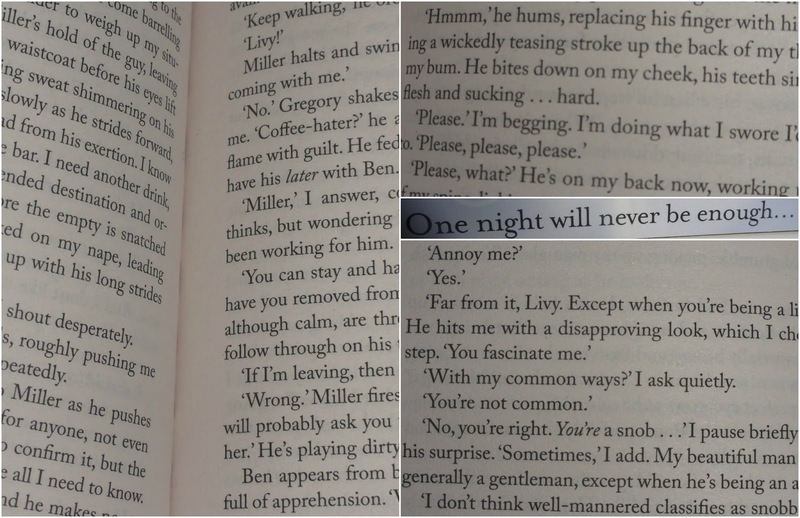 I'm a huge fan of the Fifty Shades series by EL James, and made a decision to take a risk and pick up One Night: Promised on a typical Tesco visit and I'm so glad I did. It's not that I'm all about reading a typical adult romance - being quite the fantasy geek - but there's just something about reading about romance that just makes me feel a little bit aww. Regardless of the sexual activities, which is something that happens between two consenting adults in a relationship, or not. Livvy notices him when he walks into the coffee shop she works in. He's absolutely gorgeous, with the most piercing blue eyes - them alone Livvy can't forget - and she's far to distracted to take his order, and get it right. He, however, makes an impact on Livvy, it's not his pretty blue eyes either but the disregard of her coffee, the most awful coffee he's ever tasted, apparently, and he tells her in a note signed with a simple M. It's not the first time, or last, that Livvy see's him and M is soon making his intentions clear. He wants one night, and one night only. For Livvy one night will never be enough. When I say this book made an impact on me it's down to it being so good. I read it over 2 days, over 6 or so hours and just couldn't put it down. I loved the writing style and the direction the story went in. They were certain times where I didn't know what would happen next, the majority of what happened were totally unexpected. The characters were likeable and interesting. I loved reading how Livvy opened up after years and years of torture. M, however, seems quite secluded and likes to keep himself to himself. All for good reason, of course, but it would of been nice to hear a little more about himself and his life within the book. Saying that I really enjoyed the book and were more then disappointed when it ended and how it ended, definitely on a cliff hanger and me wanting to read more. Which leaves me thrilled to announce that the next book in this trilogy will be out next month, I'm so excited and it's available to pre-order now. It's very similar to Fifty Shades. I recommend this book for any fan of Fifty Shades or the Crossfire series. 5 stars from me!